This week, the Environmental Protection Agency (EPA) released its final greenhouse gas (GHG) standards for existing power plants. According to American Action Forum (AAF) research, the final plan will shutter 66 power plants and eliminate 125,800 jobs in the coal industry. All of these figures are based on EPA data. Perhaps more alarming, using the 2012 baseline for coal generation and projections for 2030 output, the industry could shrink by 48 percent. The map below tracks the average emissions rate each state must meet by 2030. For perspective, the average emissions rate is currently 1,665 pounds of carbon dioxide per megawatt hour. By 2030, the average national rate will be 1,077, a 35 percent reduction. South Dakota, Montana, and North Dakota must make the steepest cuts (average of 46 percent); Maine, Idaho, and Connecticut (average of nine percent) conceivably have the easiest path. A topline number of 34,000 lost jobs might sound somewhat insignificant in the broader scope of the economy, but it’s unlikely the total economic loss from the regulation. In AAF’s last measurement of the economic loss of the rule, we used a PricewaterhouseCoopers study that found one energy job supports 3.7 additional jobs. If we take that multiplier and apply it to EPA’s figure of 34,000 jobs, it nets a total employment impact of 125,800 fewer workers. Given that this rule will remake the generation and transmission of energy in the U.S., it is probably a conservative figure. In addition, AAF found that the agency estimates roughly 33 GW (from 207 GW of coal by 2030 to 174 GW) of coal-fired power being eliminated by the rule. 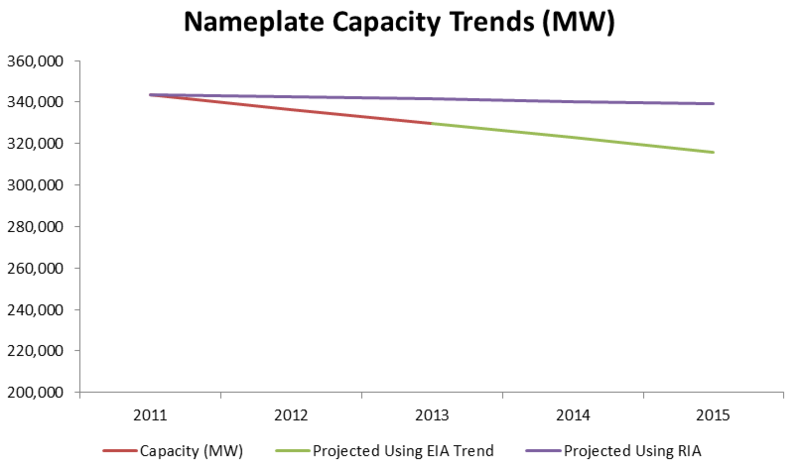 This figure is a steep drop from 49 GW estimate that EPA used for its proposed rule, but there’s more to it than that. Actual coal emissions in 2012 were 336 GW. 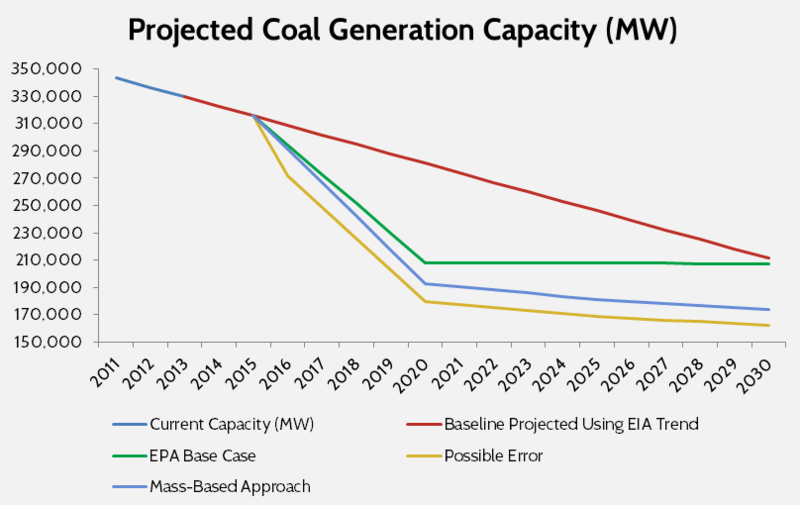 EPA eventually expects coal generation to decline to 174 GW. This is a loss of 162 GW, or 48 percent from coal’s 2012 base. 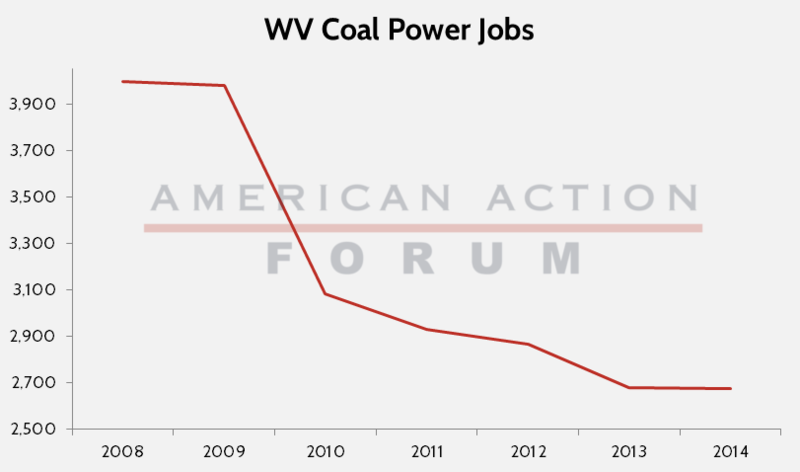 The graphs below show the cumulative impact of aggressive EPA action and the coal industry’s rapid descent. Using a similar methodology from AAF’s past work where we sorted the least efficient coal power plants in the nation and then determined which states would be most affected, AAF now predicts at least 66 coal-fired power plants will close because of the CPP. The average generation for these facilities is 514 MW and their average emissions rate (pounds of carbon dioxide output per megawatt hour) is 2,708. Compare that emissions rate to EPA’s 2030 average goal for the entire U.S.: 1,077. This disparity between the 2030 benchmark and the emissions rate of the least efficient plants explains why these 66 facilities will likely be the first to go. These figures shouldn’t be too surprising. The hit that local communities in the south and Midwest have taken, in part due to EPA regulations, is staggering. The following charts display recent trends in state coal power plant and coal mining jobs across the U.S. In West Virginia (1,318 lost jobs), Kentucky (705 lost jobs), Pennsylvania (1,096 lost jobs), and Ohio (1,395 lost jobs), fossil-fired generation employment fell by more than 4,500 workers from 2008 to 2014. 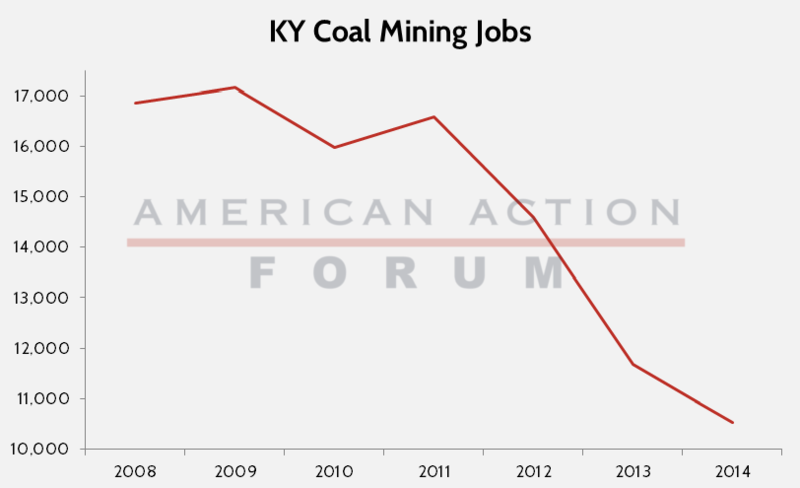 The news is even bleaker for Kentucky, as it has also lost 6,333 coal mining jobs during this period or 37 percent of the state’s coal industry. 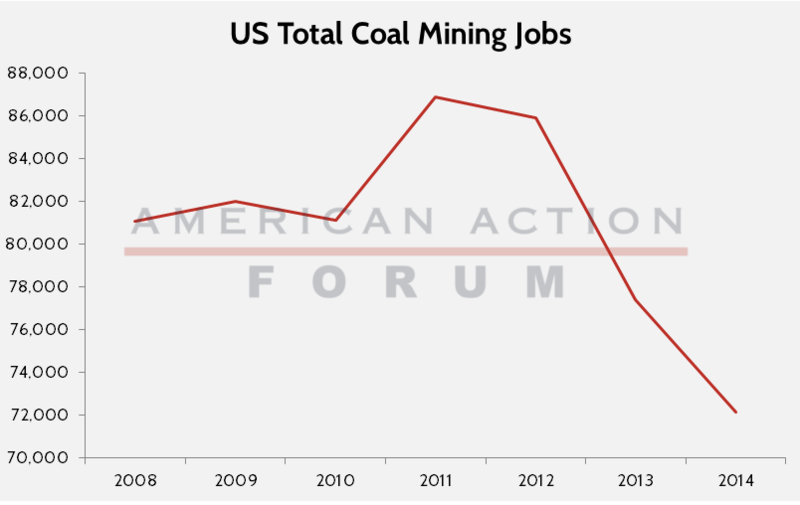 Overall, U.S. coal mining has shed more than 8,900 jobs since 2008. 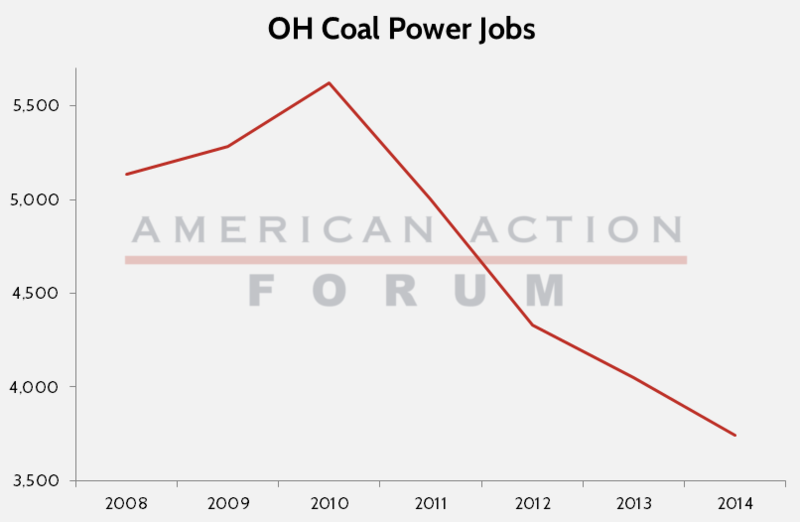 Combine coal extraction losses with coal generation declines nationwide and the coal industry has lost more than 47,500 jobs already, with the promise of more to come by 2030. These troubling figures are also static, one-time snapshots at industry employment. They hardly capture the true economic costs to the region and the local community of losing so many jobs so quickly. The PricewaterhouseCoopers study implying that one energy jobs supports 3.7 additional jobs hints at the total economic damage, but remaking an entire industry in one administration is no small feat. Much of the debate surrounding the plan has focused on EPA’s incredible annual benefit figure, compared to its still significant cost. Juxtaposed, it seems difficult to dismiss EPA’s estimated benefits, but that assumes the agency’s estimates translate into reality. Too often in the past, EPA’s initial benefit figures fail to materialize. Take EPA’s toxic air pollution rule for power plants, which was recently remanded by the U.S. Supreme Court. In its original projections for coal-fired capacity, it estimated by 2013 the industry would generate 341,000 MW of power. What actually happened? The graph below compares EPA’s projected coal generation output (the purple line), with actual data from the Energy Information Administration (EIA). In sum, EPA projections were not close. By 2013, EPA’s was 12,000 MW off from the actual result. If EPA were accurate, today’s coal plants would produce 339,000 MW of electricity. It doesn’t. It will produce approximately 315,000, according to EIA data. EPA’s toxics air pollution projections missed the mark, but what happens if the agency’s estimates for the CPP are also erroneous? The graph below tracks the EIA projected trend (red line) for coal generation between 2011 and 2030 without the rule. The green lines represents EPA’s projected generation under the rule. 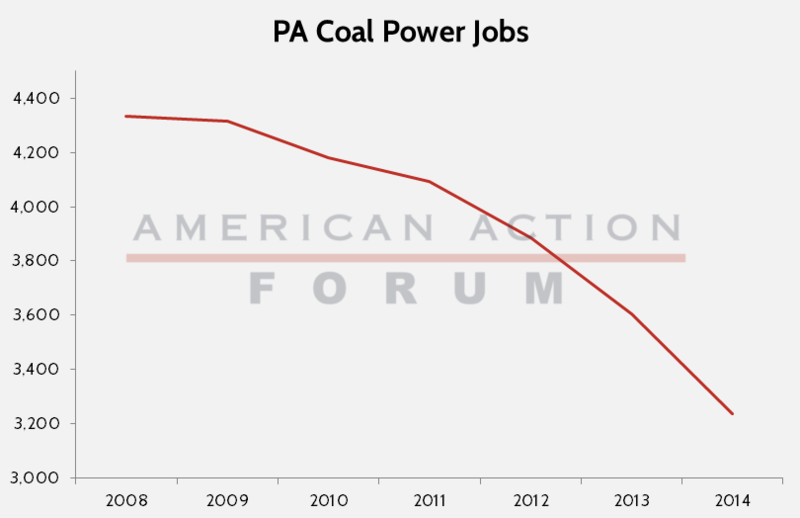 The blue line represents where EPA expects coal generation by 2030. The yellow line reflects the same “error rate” from EPA’s projection in its toxics air pollution rule. If EPA is as wrong as it was with its previous landmark air pollution rule, expect coal generation to be at roughly 162 GW by 2030, not 174 GW. This error on EPA’s part would of course translate into more coal generation retirements and additional coal extraction losses. The agency has missed its estimates in the past and there is little reason to believe its 2030 figures will be accurate. Once published, the CPP will push total regulatory costs for the year past $145 billion. On an annualized basis, final rules have already imposed $4.8 billion in costs. However, the most expensive current measure (efficiency standards for fluorescent lamps) will add just $841 million in burdens. At $8.4 billion, the CPP is almost ten times more expensive than the most burdensome rule of 2015 to date. It is no wonder the measure will likely close at least 66 plants and eliminate 125,800 jobs.